An important aspect of a construction project that often tends to go overlooked is how the various materials used in the construction project are stored and handled. With so many variables and materials being used by different people, it’s not always easy to comprehensively keep track of where everything is going. In regards to pipe, a few simple things to keep in mind can make the project easier to manage while potentially boosting productivity and efficiency. Pipe should always be given the proper support and it’s a good idea to consider storing it in layers, with any sockets being placed at the end of a stack. If the pipe is going into storage for more than a year and it is receiving direct sunlight, it’s a good idea to cover it up with some material, such as hessian for instance. This allows the pipe to “breathe” and remain cool. Refrain from covering the stack with any materials such as black plastic as this will attract sunlight and may cause temperatures to increase, potentially damaging the pipe over the long-term. 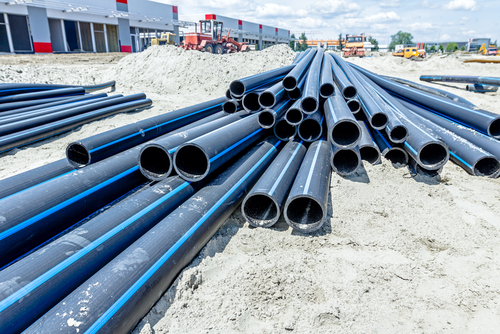 The idea roughly applies to thermoplastic pipe which should not be stored in an area that is tightly enclosed where temperatures can skyrocket and cause slight distortion or deformation.